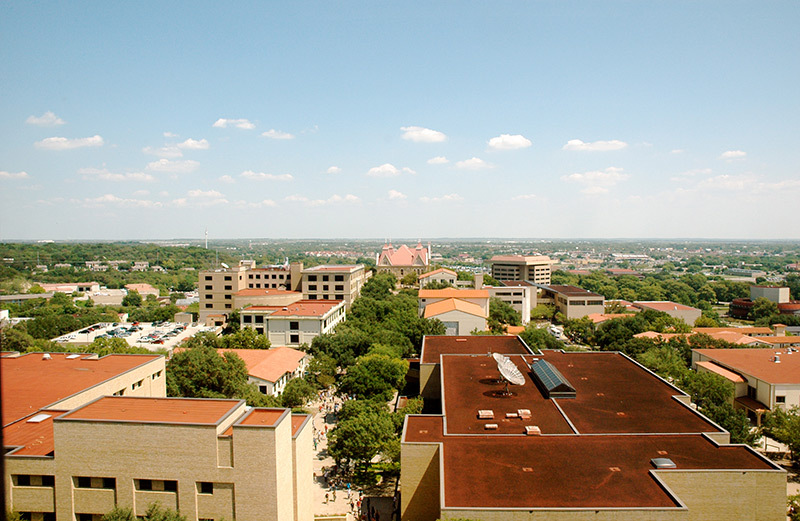 In San Marcos, Texas, the School of Art and Design at Texas State University offers undergraduate and MFA programs in communication design. The curriculum covers everything from graphic design to corporate advertising art direction, to international perspectives on typography. I spoke with Grayson Lawrence, Assistant Professor of Communication Design at Texas State University, about prototyping, design as an ecosystem, and what it takes to be successful. What do you teach at Texas State? I teach Beginning Web Design, Responsive Web Design, and Mobile App Design in our undergrad program. 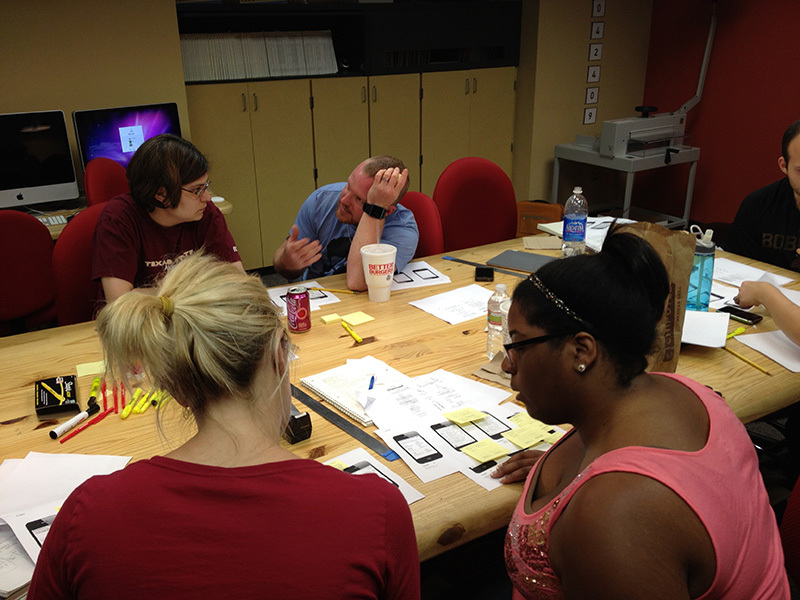 In our MFA program, I teach Web Design, Mobile App Design, and User Experience. Design is constantly evolving—especially interaction design. Sometimes I joke that I wish I taught something that didn’t change so much, like calculus. I’ve rewritten my courses almost every year. Texas State University. Photo by Red. Creative Commons Attribution-NoDerivs 2.0. At most universities, being on a tenure track means you have 3 jobs: teaching, research, and service, where you serve on committees and do volunteer work. For research, I write academic papers and grants, plus I do freelance work. I focus on the teaching more than anything, because I think that’s most important—we’re here for the students. Still, your research is supposed to inform your classes, so doing research keeps you from getting stale. I bring my research back into my classroom—that’s one of the reasons I use InVision for prototyping in my freelance work and in my courses. UI and UX design constantly change. How do you deal with that as an instructor? Designers are now responsible for designing the whole system—not just an ad or website . An app connects with your ad campaign, and that connects with your radio spot, and television connects with your website. Great designers understand that design is an ecosystem . We don’t live in a vacuum—an item you make is part of a bigger picture. We’re trying to get our students to think that way. What level of experience does your average student have? 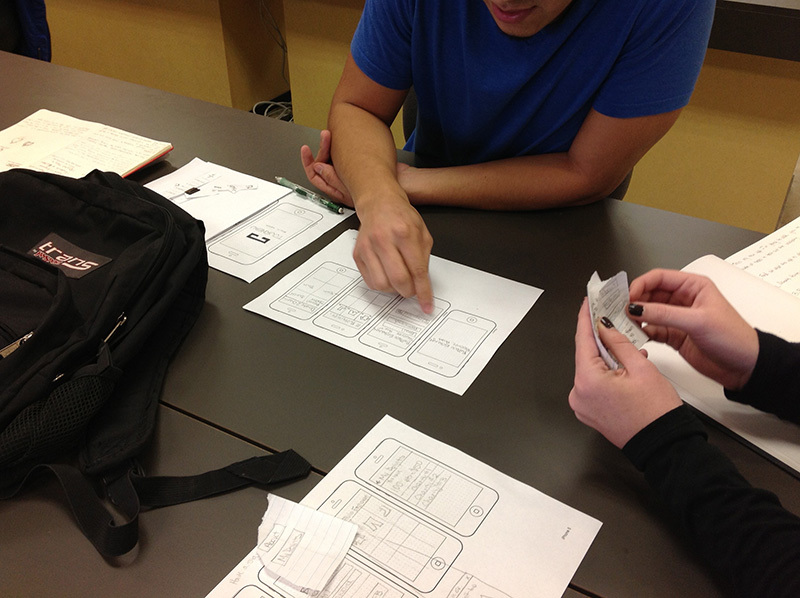 For undergrads taking my mobile app design class, it’s the last interactive class they’ll take before they graduate. So most of their experience has been in traditional design: working with books, magazine layouts, editorial, brand, and corporate identity. Many of them have an advertising and art direction background. Students have to take 2 required interaction courses before they take Mobile App Design, so they’re much more familiar with the principles of design. At the graduate level, students’ experience level varies. We’ve got some students who’ve been working in the industry for 15 or 20 years as traditional art directors or even interaction designers. What’s the main difference between undergrads and graduate students? Undergrads are fearless, while some grad students come in with apprehension. Undergrads think differently, as if it’s a 1-way mirror and you just consume. For example, you go on Facebook and Twitter and you consume. We’re training students to be innovators of technology, not just consumers of it. What are some of the challenges that you face in your classes? With the beginning web classes, the HTML, CSS and design mechanics intimidate students, but they take to it quickly. The app course is designed to get students thinking about the user as a consumer, so it’s half user experience and half interface design. We go through lots of user prototyping at the beginning. We user test with each other in the class, and I also have them go out and test with their friends and family. When a user gets confused by just a button or a word, students are blown away. User testing helps them realize it’s not just about having a punchy headline or a really cool graphic or funny concept. It’s also about the nuts and bolts—the dry stuff we all have to remember to do, like including a phone number or an address on a poster. I always use this example: “There’s starving children in Africa. What can I do about that? They didn’t put a phone number or a website on there, so I guess I can’t do anything.” Students spend all their energy designing posters, but they forget to include a call to action. 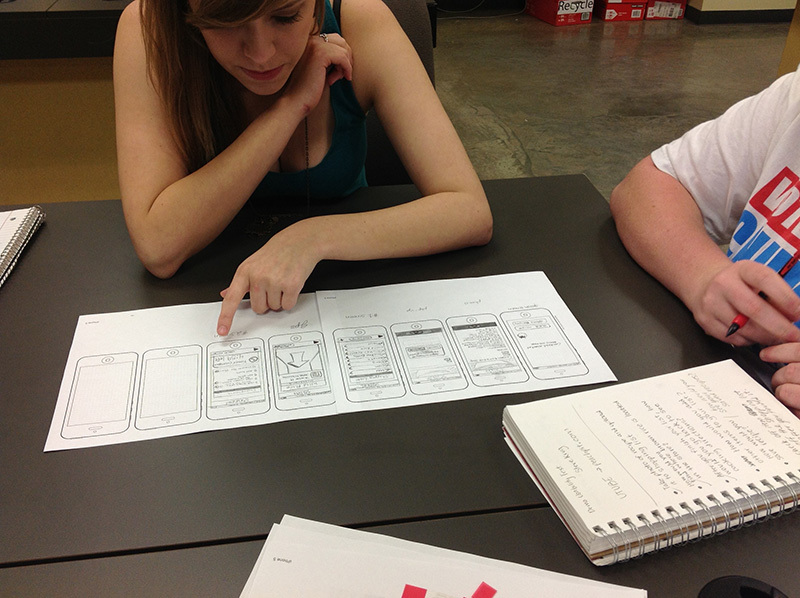 That’s something they learn in Mobile App Design thanks to the prototyping process we put them through. They realize it’s not like painting a building—it’s more like building a building. You need a foundation, and then before you can put up scaffolding you have to actually design and build that scaffolding. That’s the grid you work on until you get to the finished product. What’s your approach to mobile app design? I talk a lot about patterns and what people expect to see when they use an app or visit a website. I’m into cars, so my favorite way to introduce this is to show a hydraulic steering wheel and ask where the car horn should go. Everyone says it should be the center of the steering wheel. If 99% of people expect it to be in the center, don’t put it somewhere else. And if you do put something somewhere else, you’d better have a good reason. Leveraging those patterns doesn’t mean your creativity has to suffer. You’re actually communicating better with them. How do you teach students to work with developers? We have a couple of students who are double-majoring in computer science and graphic design, so things are getting more technical. I’m currently working on a hackathon that’ll focus on wearables. Last year, we put together a team of 2 developers and 2 designers to work on a mobile game. I’m trying to push the cross-discipline discussion that we’re not just making pretty things as designers. Designers shouldn’t go in at the end of a project—we should be there from the beginning . What’s your approach to providing feedback on students’ designs? We’re open about everything when we’re giving feedback to each other—I think it’s important for everybody in class to be able to speak. We delve into branding, UI elements, and functionality, as well as who’s going to be using it. Sometimes it’s verbal feedback, but I really like being able to add notes in InVision. I’ve used that feature a lot with clients as well. 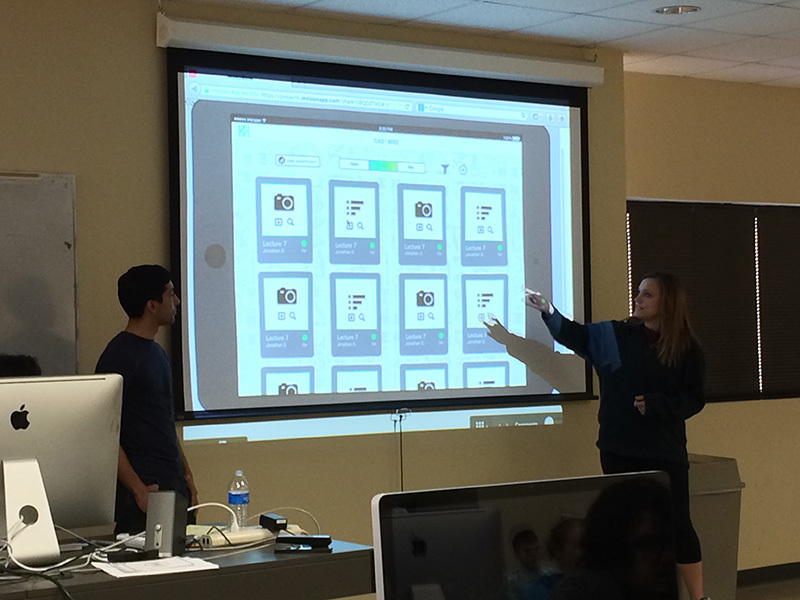 During our final critique, we’ll display everything on a projector for people to discuss things like branding, messaging, typography, and the UI. We go back to that design ecosystem, too, and talk about whether an ad campaign is possible. This project is one of the last pieces to go into a student’s portfolio, so the goal is to make it tight. Do you have any tips on how to effectively present a design? Present a prototype on the actual device rather than flat pieces of paper . From a collaborative point of view: send a working prototype to developers that they can play around with. That requires much less documentation on the designer’s end—it’s a time-saver. Where do you see the design industry or the mobile development industry going 5 or 10 years from now? My hope is that there will be more of an emphasis on cross-discipline interaction. I’ve always seen design as a social science. We need some knowledge of psychology and sociology to effectively communicate with people. We should focus more on how design affects other people’s lives and how we, as designers, are pushing them. Designers need to ask themselves if they’re making something that’ll positively affect someone, or if they’re just making more noise. I think we’ll need to take a serious look at wearables, too—medical wearables, specifically, might be a great next step. I love David Rose’s idea of enchanted objects. An example would be a wifi-connected umbrella whose handle glows when there’s rain in the forecast that day. There’s no UI—it’s almost atmospheric. Interaction experience is well sought after. We’re always looking at job postings to make sure that we’re teaching the right material and making sure that if somebody’s asking for certain skillsets, we give those to our students. Companies want people with HTML, CSS, and user experience on their resume not just for interaction jobs, but for branding and art direction jobs. Companies want to hire people who can hold a conversation —it all goes back to the design ecosystem idea. It’s our job to prepare students for the job market of the next 5 or 10 years. We’re constantly looking at our curriculum and making little tweaks—our curriculum is iterative. Enjoy what you do. Do what you love, and the money will follow . Never pick a career just because of the paycheck—pick one you’d do it for free. If you have the mindset that you’re going to work really hard, you’re going to be successful. If you don’t like what you’re doing, you’re not going to work hard and you’re going to struggle. For me, it’s more of a matter of attitude. Technical skills are very important, but you have to be willing to work hard and take your job seriously. Be fearless. Don’t be afraid to talk to people who are “out of your league.” Talk to developers, even if you have no idea what they’re talking about—that’s how you learn. Talk with business people. Talk with people who are better than you. If you’re the smartest person in the room, you’re in the wrong room. 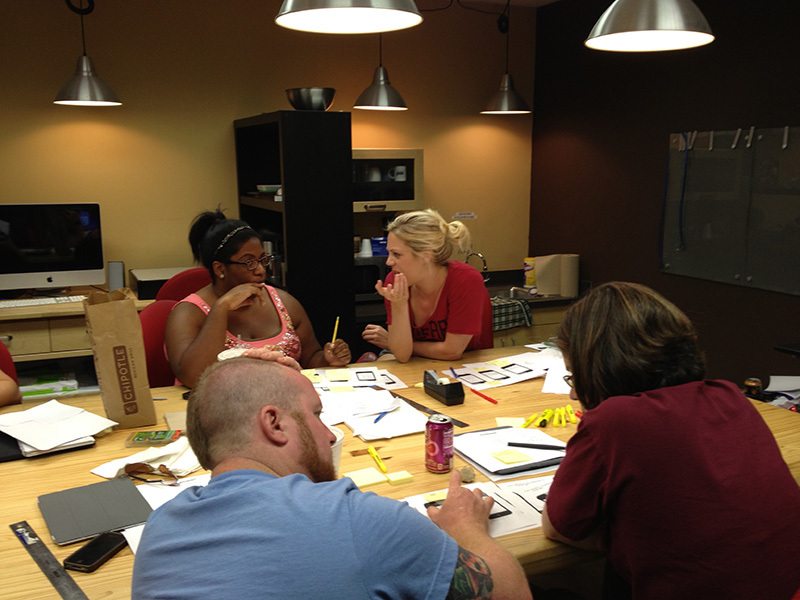 What’s the most exciting part about teaching designers of tomorrow? The thing that puts a smile on my face? When students come back and tell me they got a job because of what they learned in my class. And I love the light bulb moments where students suddenly get something to work. At the end of the day, you want to feel like you’re making a difference. What tips do you have for people who are teaching and mentoring designers? Understand that your job is important. Be proud of your profession. And I mean for every level of teaching, not just college. How does InVision help your teaching strategy? InVision is integral to the prototyping process I use in my user experience courses. 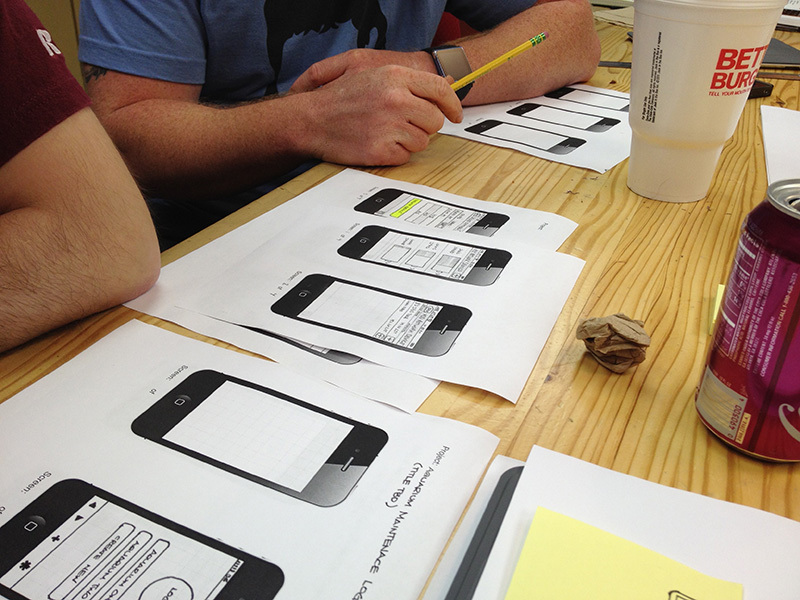 We start off with prototyping on Post-it notes, and then we move into wireframing in InVision. All the final prototypes start in InVision. The best thing is that it’s easy to use. I give a 10-minute demo, and that’s it—students run with it. It’s especially great for students who aren’t skilled in HTML and CSS. Overall, InVision lets students focus more on user experience. It also improves their portfolio—they can be at a job interview and just pull their phone out to show a working prototype. It’s almost a fake it till you make it thing—it looks like it’s running, and that’s ridiculously cool. The collaborative parts of it are great, too. Students can share a prototype with me, and I’m able to make comments. 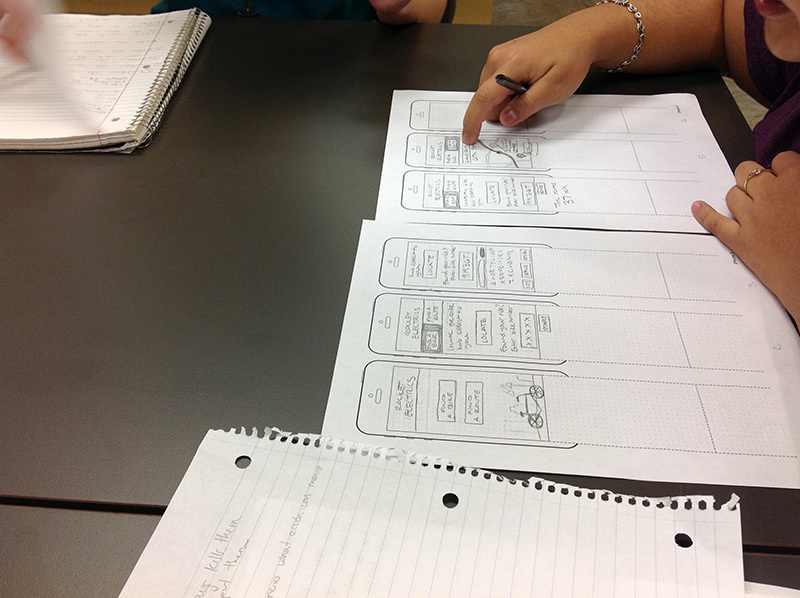 What does InVision teach students about the design process? The idea of design as iterative. They learn that in other classes, but the concept really sets in when they do the prototyping exercise in my class. InVision lets you fix problems faster and cheaper than if you’d gone straight to development. When you slow down and don’t rush to the end product, the time you spend at the beginning to pinpoint your problem pays off in a big way. From looking at design every day, especially on social media. I’m inspired by people I talk to and their backgrounds, too. My first love is advertising—I love looking at TV and print ads. Old magazines, book covers, and records are a source of inspiration as well. You have to get inspiration from all around you.